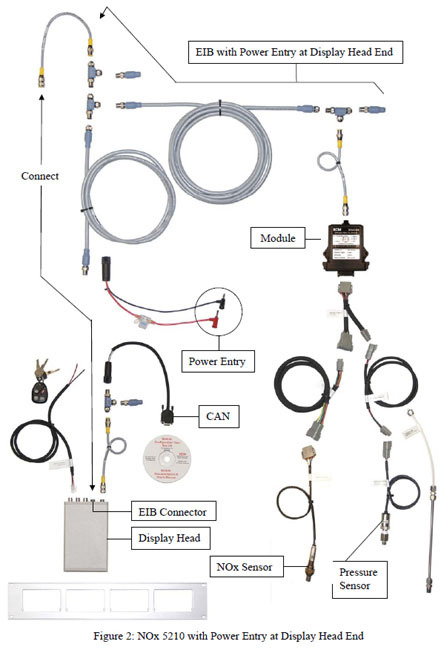 ECM's NOx 5210 is a versatile and highly integratable NOx, Lambda, and O2 analyzer for the development of engines (ex. spark-ignition engines) and combustion systems that can operate rich, at, and lean of stoichiometric, and their aftertreatment systems. 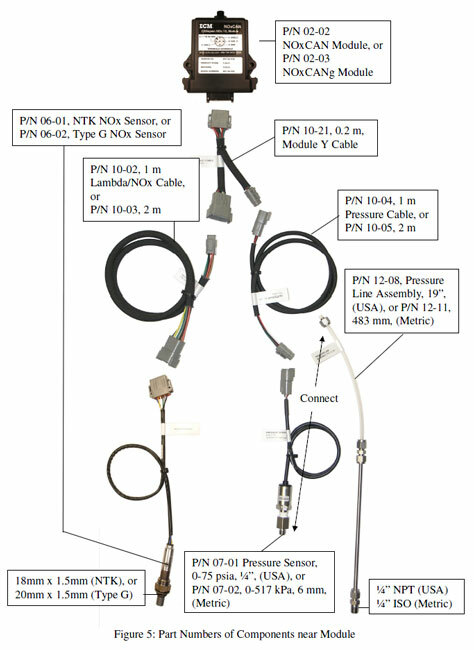 NOx, Lambda, and O2 are measured using a ceramic sensor that is mounted in the exhaust of the engine. Ease-of-use, speed, compactness, and robustness are hallmarks of this technology. No sample lines or pumps are required, simplifying installation and giving fast response. Distances of up to 100 meters between the sensor and analyzer are possible with no loss in response time or accuracy. All sensors have their calibration stored in a memory chip in the sensor's connector. Calibration can be performed by the user (Zero, Span) and is written into the same memory chip. 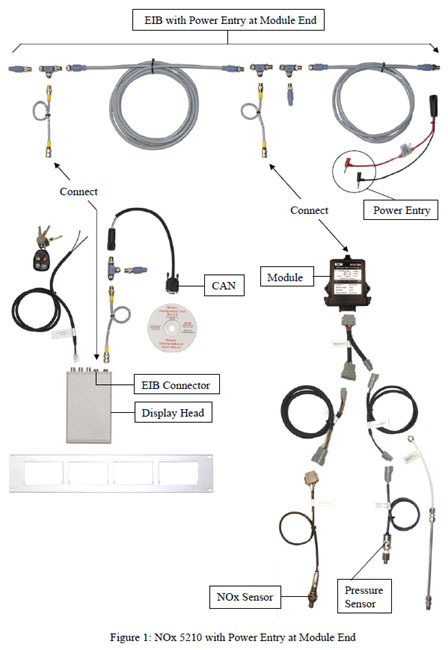 This allows sensors to be calibrated in a central location and distributed to users, ensuring consistent results throughout a large test facility. The NOx 5210 is programmable for all fuel types (H:C, O:C, N:C, and H2). NOx, Lambda (λ), AFR (air-fuel ratio), Equivalence Ratio (φ), and %O2 and all sensor parameters including pumping currents, cell resistance, and sensor age factor are available for display and output. A second NOx/λ/O2 channel can be added and displayed/output. The NOx 5210 is remarkably compact and is suited for both dynamometer and in-vehicle applications. 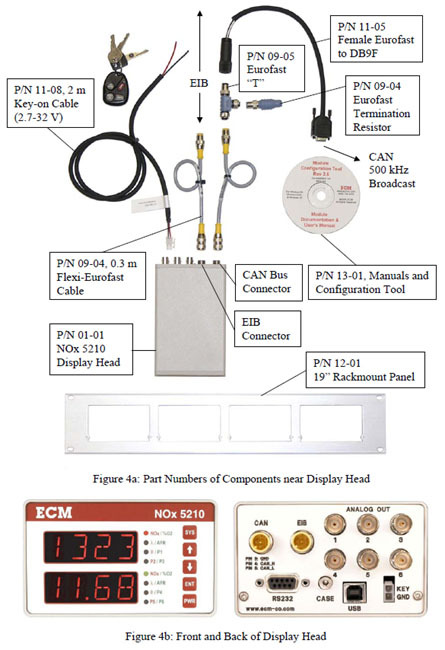 With six analog outputs, CAN, USB, and RS232 communication, the NOx 5210 can be integrated into any data acquisition system. To simplify in-vehicle use, the NOx 5210 can be turned on and off with a signal from the vehicle's ignition switch. 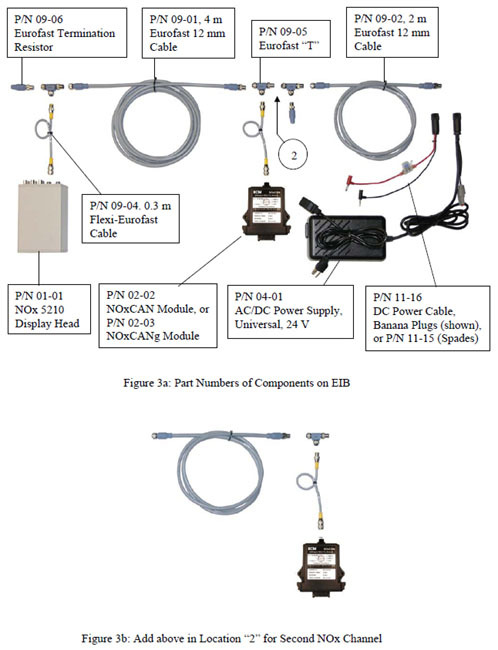 This feature along with the analyzer's CAN communication capability make it possible to use the NOx 5210 in the loop of a real-time emissions control strategy. 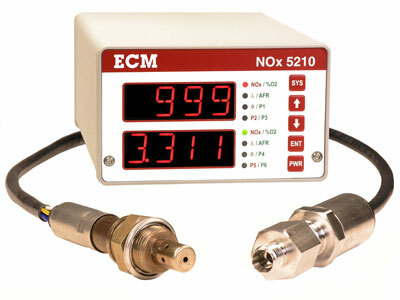 The NOx 5210 was ECM’s first NOx analyzer and has been upgraded by the NOx 5210t. It is recommended that users of the NOx 5210 use the BTU200 sensor heater. For applications where a 12V power supply is used, a Vboost Power Supply (P/N 04-02) is recommended. This raises the voltage supplied to the sensor to 24V where its temperature can be better.